What happens when you refuse to sell your house to make room for a new construction project? Lacking the balloons and helium to make an Up-ward escape, 67-year-old Luo Baogen of Xiayangzhang village and his wife decided to stay put, refusing the government's offer to purchase their property. So the government simply went ahead and constructed a road that completely surrounds the couple's house. 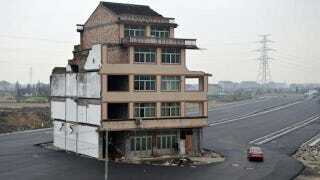 China Daily reports that in 2008, more than 500 local families began to vacate their homes after reaching settlement agreements with the government is Wenling, Zhejiang province. However, the Luos don't feel that the offered compensation of 260,000 yuan ($41,700) is enough to cover the expense of building another house elsewhere in the village. In 2007, China passed a law guaranteeing private property rights, meaning the government cannot exercise eminent domain. But after a four-year standoff, the government went ahead and built the road anyway, leaving the Luo home stranded in the middle. The rooms on either side of the house were left intact to protect the house, but Luo claims the roof has leaked since the demolition. The road is not yet in use. There was a similar case in Beijing in 2002, when two brothers also failed to reach a settlement with the government to demolish their house to build a road. The government ended up building a smaller road than was originally planned, which has apparently resulted in dramatic traffic congestion in that area.